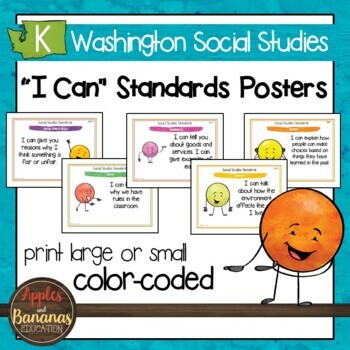 We have taken the Washington State social studies learning standards for Kindergarten and turned them into "I Can..." posters and statement cards so that your kiddos can boast about what they can do! Color coding and icons are supplied for each type of standard. 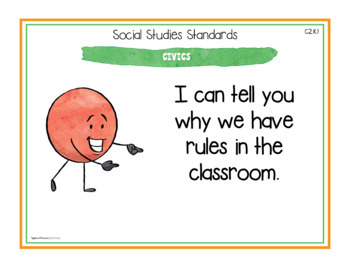 For example, all "civics" standards are green and have a corresponding icon for easy reference. Other categories for Kindergarten include history and social studies skills. 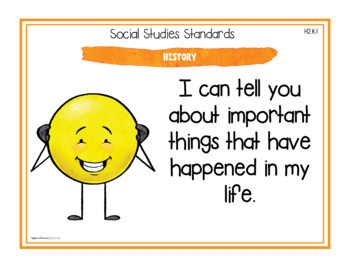 A one-page "at a glance" handout is provided so that teachers and parents can quickly navigate the standards. *There is an "I Can..." statement for every standard. Each standard is provided in easy-to-read poster format for landscape printing. 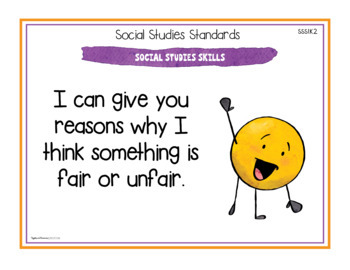 Put these on the board while you teach so that students know what is expected, post them next to a bulletin board, stick them in your classroom library or display at applicable centers - the possibilities are endless! *Posters have the exact standard number written in small print along the top for easy reference. **If you like what you see, please click on the "Follow Me" star to learn about new products, sales, and more!